I have been digesting this for a bit now and still find myself struggling to find ways to properly express how I feel about this book. I will say that book 1 did not wow me as much as I had hoped but it did hook me enough that I wanted to read the next book. I was curious to find out what happened and I’m glad I did. This book was the razzle dazzle that was needed to revive my love for the series. I know the book has released but I’m still going to give a spoiler-free review. 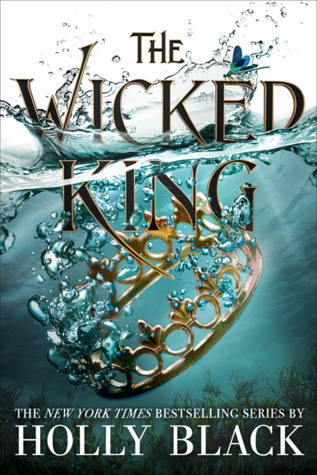 This book picked up right where The Cruel Prince left off. The constant dynamic between Jude and Cardan had to be one of the sexiest and most intense I have encountered in a while. I couldn’t get enough of it. Both characters were delicious, complex, and yet heavily flawed. I felt this added to their depth and development. These two were clearly made for each other. As the story progressed, I really did not see anything coming. I thought I would be able to predict events but I was oh so wrong. There was so much betrayal, lying, under-handed dealings that I was on the edge of my seat turning pages as quickly as I could in an effort to find out what was going on. Masterfully done on Black’s part. She proved she knows how to engage an audience and keep them guessing and does so in a way that makes it look easy. While I am gushing a lot about the characters, let’s not forget there is a lovely romance tucked between the folds of a compelling action story. It’s so wonderfully hidden that when parts of that do come up, it simply catches you by the feels and never lets you go. I know a lot of people have been on the fence about continuing the series since the first book didn’t hit home for everyone. I’m here to urge you to read the second book. It is better than the first and will have you dying to know what happens in the next book. Pick it up NOW.